What is The Bridge? What do you do? The Bridge of Hope is a Christian non-profit organization dedicated to helping children, families, and communities in Sierra Leone, Africa by teaching them about God's love and grace and helping them to have access to the basic needs of life, where they are healthy, equipped and empowered to support themselves and find purpose in serving others. We know that poverty is complex and is seldom solved by one intervention. We look at each communities needs — a sponsored child and his or her entire community — and how they will benefit from all of our programs: clean water through new or renovated wells, school fees paid for and supplies provided, better education due to new and restored schools and teacher training, improved nutrition due to feeding programs and agricultural training, improved health with free healthcare clinics, hygiene training and vitamin projects and restored hope with planting churches and biblical training. We strive to help transform the lives of the world’s poorest children and families in Sierra Leone through programs that include a wholistic approach to meeting the physical and spiritual needs of people. Our non-profit work extends assistance to all people, regardless of religious beliefs, gender, race, or ethnic background. Does my monthly gift go directly to my child? The Bridge Child Sponsorship Program allows for a one-on-one relationship with a sponsor, while pooling the gifts of all sponsors who support children in the same community so that we are able to provide resources for long-term change for the lives of everyone involved. A sponsored child does not receive direct cash benefits like a welfare system. We believe in responsible spending. Giving the child’s family money does not ensure the donation will help the child or that the community will be able to sustain itself once The Bridge is no longer working in the area. Successful development that frees people from long-term poverty is discovered in helping people realize their God-given value and purpose as human beings created in the image of God. Spiritual transformation that instills hope and promise for the future is a fundamental key. Clean water, health care, agriculture, education, and income generation are important, however they are secondary to the basic work of getting the community to take ownership of these projects long-term. The needs and participation of children are most important, as they are the future of their community. Our goal is to teach, instead of handing something over that is already done. Can I send money and other gifts directly to my sponsored child? We are working on making this an option in the future! Shipping has been unreliable and expensive. Right now the only reliable way of getting gifts there is through our team visits during short-term mission trips, but that is difficult because we bring important supplies that help a whole community. So for now, monetary gifts are the best way to support your child and allow for growth of their own economy. What benefits does my sponsored child receive and how are my sponsorship donations used? The goal of The Bridge's child sponsorship is to make life better for children, giving them HOPE for the future. Our child sponsorship programs have four basic aspirations that guide our work and on which our work is measured. In addition we work with local churches and our own schools to ensure that a sponsor's gift will also help provide a Christian education program to give children the chance to learn about Jesus and His love. The costs of keeping records on sponsored children, translating and forwarding letters, and meeting emergent needs are also covered through the monthly sponsorship gifts. A portion of these funds supports local nurses, teachers, and other specialized staff members who serve sponsored children in their communities. 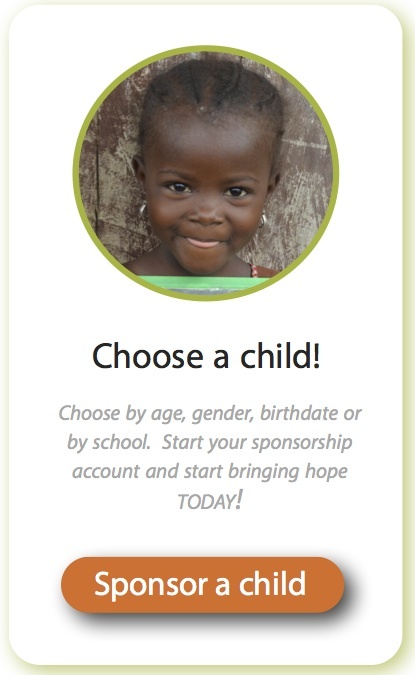 When a child is sponsored they are notified. Then begins the relationship between child and sponsor. The joy of just knowing someone in a different part of the world cares enough to help and pray for them gives them the hope they need to continue. Will my sponsored child learn about Jesus? The Bridge also plants churches and makes sure that all we do is centered around the local church. Persons of any faith are welcome into our schools but often sponsored children and their families, after being touched by the love and care of The Bridge staff, have asked questions about our faith; many have come to share it. Our role in the kingdom is to be faithful to His command to serve the poor, and The Bridge believes that only God can change hearts and we are to be His vessels of change. What makes a child eligible for sponsorship? How are children chosen for sponsorship? As The Bridge expands we are able to work in more communities in and around Makeni, Sierra Leone. Once we have a school program up and running in that community, those children become part of our Child Sponsorship Program. Your sponsorship may last several years, depending on the needs of your sponsored child. The goal of The Bridge sponsorship is to help your sponsored child and his or her community to break free from poverty, and become self-sustainable so they can have a future filled with hope. At this time, our schools are focused only on primary education. We hope to follow many of those children once they graduate from primary school and enter secondary school. Continuing to sponsor a child into those years will depend on our ability to keep track of them and provide accountability and assurance of how the support is being used. What do I receive when I sponsor a child? About 2 weeks after you sponsor a child, you will receive a Welcome Kit in the mail with your child's photo and more information about sponsorship. Within 6 to 12 weeks, be looking in the mail for your first letter from your sponsored child! The timing varies depending on the availability of our in-country staff and the Internet access. How can I correspond with and even visit my sponsored child? We believe that relationships change lives and the bond that you build with your sponsored child will change both their life and yours. Once you sign up to sponsor a child you will have access to your account and be able to correspond with your child by typing or scanning letters. Most children will not have access to the internet, but our leaders in-country will be taught to use the system and take a printout of the letter or picture to the child. In turn, they will also write you a letter that can be scanned in and sent back to you. You may also choose to visit your sponsored child for a life-changing adventure neither of you will forget by going on one of our short-term mission trips. Please note that trips are usually offered between January and April, which is their dry season. Planning and preparing for these trips start in the fall. © 2019 The Bridge of Hope. All Rights Reserved.